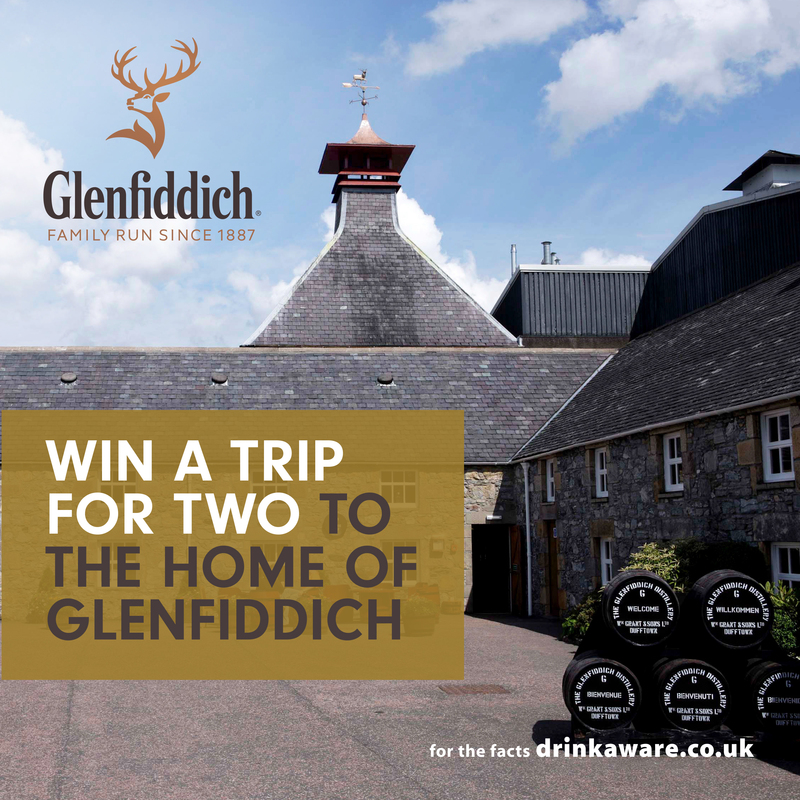 To enter, just tell us what you love about Glenfiddich whisky in the comments below, along with your latest order number. At The Glenfiddich Distillery, time and experience are the heart of the operation. Accumulated and passed down through five generations, the rich whisky making experience of our craftsmen ensures each variant in the Glenfiddich single malt Scotch whisky range matures exquisitely well – balancing rich complexity with Glenfiddich’s unmistakable character. Now is also a great time to check out our Glenfiddich offers. 1 x Weekend trip for two to the Glenfiddich & Balvenie Distilleries including flights, transfers and accommodation. Dates subject to availability. Travel insurance and spending money not included. Winner and companion must be over the age of 21. The closing date and time for entries into the prize draw is 23.59 on 16/11/2014. Entries placed after this date and time will not be included in the prize draw. The winner will be selected at random in the week commencing 17/11/2014. Glenfiddich 12 Year Old Single Malt Scotch Whisky 70cl will be added to Favourites for all customers who enter. This entry was posted in Competitions and Prize Draws, Talking Ocado and tagged Balvenie, competition, distilleries, distillery, freebie, gievaway, Glenfiddich, malt, Ocado, Ocado deliveries, Ocado groceries, ocado.com, on the rocks, prize draw, scotch, shopping, Shopping at Ocado, trip, weekend away, whisky, Win by Ocado. Bookmark the permalink. A smooth drink that is perfect on its own – reminds me of late night chats with my Grandad, who is no longer with us. I’m going to be controversial, and say that the thing I most love about Glenfiddich is its place in a whisky cocktail (sour or jock collins). It’s my favourite winter warmer, and you can really taste the quality. My husband and father despair of me! Glenfiddich makes a big first impression and is consistently smoky throughout. Surprisingly light and dry finish, best served neat. It has to be enjoyed without ice to get the depth and the characteristics of this lovely dram. I have fond memories of visiting the Glenfiddich distillery as a child. Unfortunately, I was too young to appreciate or taste any of the whisky at the time, so would love a chance to return as a bearded whiskey-fiend. If I fail to win, then I will look forward to Christmas, as Glenfiddich is my Pa’s favourite dram. He is always well stocked with the unmistakable triangle bottle of full-bodied 18 yr old. Latest order no: 3970267700. I love the warmth it gives me, combined with the intensity of flavour. No ice for me, thank you! Reassuringly warm, smooth and pure, like a warm hug on a cold winter’s morn. The Speyside area is one of my favourite places on earth. The rugged landscapes, the sprawling vistas, the wildlife, the warm and friendly people – it’s a fabulous place. I have always thought that Glenfiddich captures the essence of it’s environment perfectly. The flavours mirror the naturally beautiful complexities that surround the distillery and the waters that flow through it. Best holiday in Scotland was sampling this amazing drink ,never looked back . The perfect smooth everyday whisky! Order 3848247401 . Back in my days of being a chef in The Commanders mess. I had the good fortune of being one of 3 chefs chosen to prepare a Burns supper. The Haggis was piped in , then our guest of honour poured Glenfiddich over it and set light to it. It was an amazing evening. Unfortunately our guest of honour was killed a couple years later. She was Lady Diana. It’s one evening I will never forget in my years of being a chef . I disliked whiskey until my best man bought me a bottle of Glenfiddich 12 YO. The 15 year old is the smoothest Scotch I’ve tasted. 3309262808 – It always reminds me of Christmas, sitting around the fire with family relaxing during the holidays.